An iconic object, but is it real? Republican opinion at the time was sceptical but the Figaro journalist championed the authenticity of the treasure, which Mlle Capriol de Saint-Hilaire's father had purchased from a Parisian scrap metal merchant in the the rue d'Argenteuil as long ago as 1805. 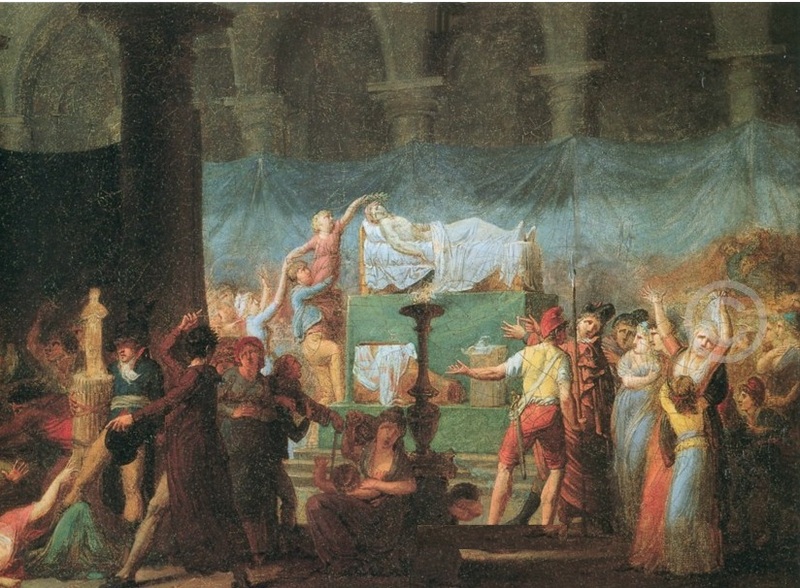 Anon, Funeral of Marat in the former Cordelier Church Musée Carnavalet. Unfortunately, the fate of the bath between Marat's assassination in 1793 and its supposed rediscovery in 1805 is to say the least uncertain . Immediately after Marat's death, the Justice of the Peace for the Théâtre-Français Section placed seals on Marat's possessions and recorded a detailed inventory which did not include the bath. 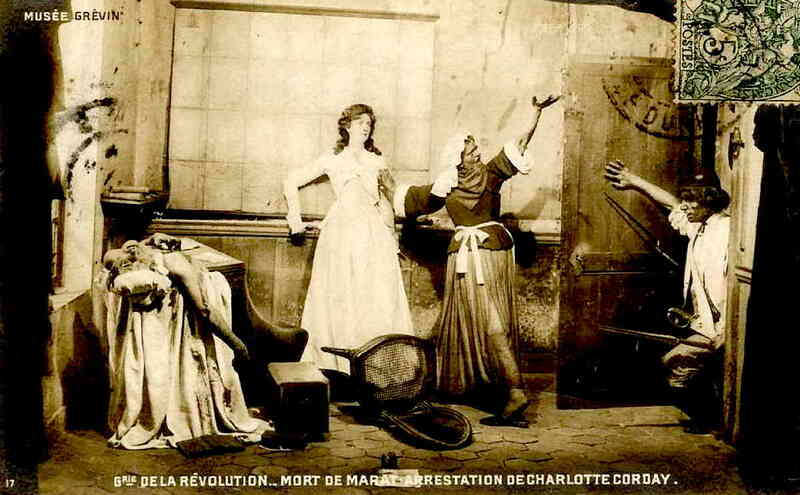 It was, however, displayed prominently, together with Marat's bloody shirt, in the Church of the Cordeliers where the body lay in state immediately prior to his funeral on 16th July. Both are clearly visible in the painting above (with, I think Marat's table and inkstand?). 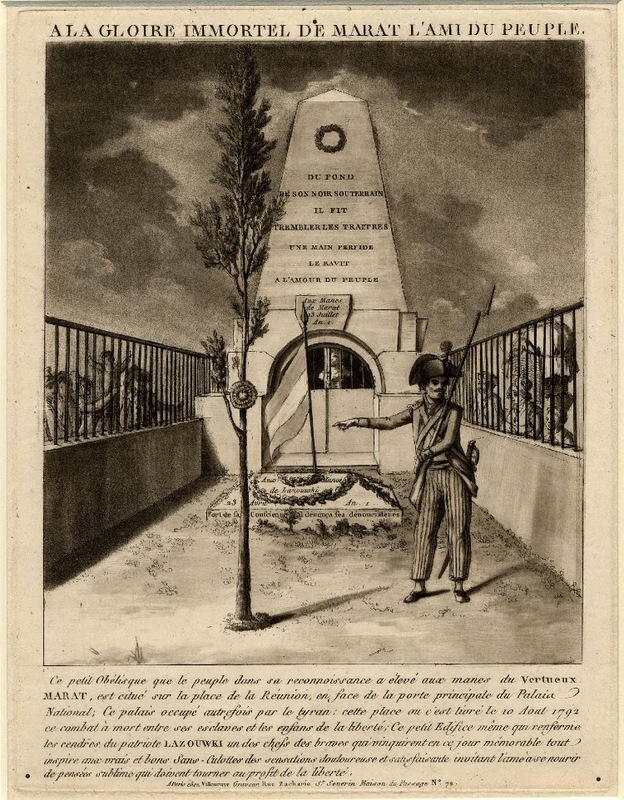 It also later featured in the monument erected to his memory in the Place du Carrousel on 18th August, a wooden pyramide gothique which again contained not only the bath itself (presumably the real article) but also Marat's desk and ink stand. Lit by a lamp, the interior of the pyramid with these relics could be seen through an iron grille. Was the bath spared from destruction in February 1795 when the Convention ordered the demolition of this monstrosity? Maybe so, but if it was rescued and resold, no-one was saying. "Some years later it was rediscovered by a Justice of the Peace when he was called to an apartment in the rue de l'Ecole de Médecine, next door to the one formerly lived in by Marat. Following the death of the apartment's owner, the journalist, the Justice of the Peace had to make an inventory of the contents before placing seals on the doors. Among the items listed in the inventory were a library of books, two spheres, an old box, a surgeon's instrument and, of special note, the bath" (Ransom, p.252). There is no need to imagine a journalist neighbour: the "terrible publicist" is Marat himself and the inventory items are clearly his (though without the bath). In some of the newer versions, the (imaginary?) journalist even becomes the bath's purchaser, M. de Saint-Hilaire himself....How myths are made in the age of the internet!